Many of the us (retail investors) are searching for the Holy Grail that enable us (quickly or gradually) to achieve the ultimate goal of financial freedom. It might mean rigorous saving and/or clever investing (or so we thought). If you are the luckier one, it might be a smooth sailing process, however, if you are not (that lucky), it might be a long and hard journey before reaching the goal. Without a doubt, many peer investors/bloggers here have achieved the goal. Kudos to them. 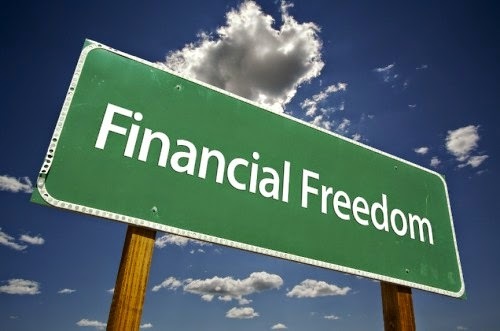 Having said that, financial freedom does not automatically lead to happiness (in life), which is a bigger thing (to me)! You might have all the money in the world, but your soul still be as hollow (as before). Hence, while we are searching for that Holy Grail, let's not forgetting to live our life to the fullest and enjoying/appreciating what we've got. The key is NOT to wait until we achieve financial freedom but do it NOW. What is the point of achieving financial freedom if you feel that life is a misery? What is the point of achieving financial freedom if you treat 5 cents bigger than cattle wheel (I am exaggerating here)? What is the point of achieving financial freedom if by then the one that concern you more is medical cost? I agree that financial freedom will not necessarily contribute to happiness, but then again what financial freedom does allow me is to always be able to pursue my goals unhindered. I suppose if I had an ultimate goal that might be a factor. But so long as I have something to pursue I am happy. Jim : That's good, looks like you have strike an appropriate balance i.e. enjoying what you are doing (non money related) while achieving financial freedom. These days everything is about balance. Too much is wrong too little is wrong too.